Mayor of Boston Marty Walsh became the first Honorary Freeman of the County of Galway on Monday last at a moving ceremony held in Áras an Chontae. 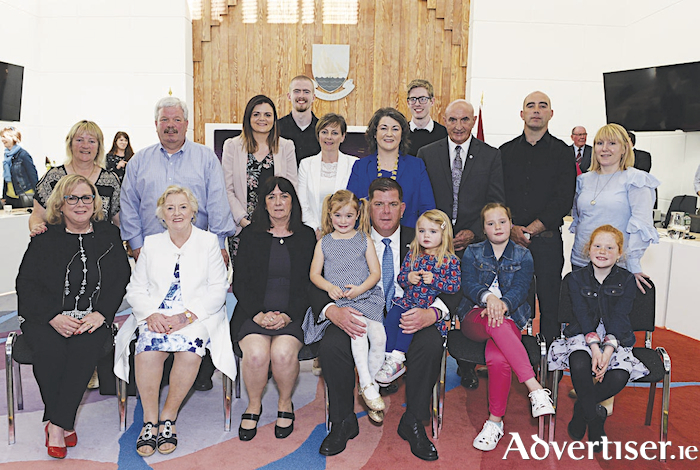 Distinguished guests from community, public service, community life and member of Mayor Walsh’s family from Connemara and Boston were present for the formal Granting of the Freedom held in the Council Chamber followed by a Reception in the atrium of the building. Councillor Eileen Mannion, Cathaoirleach of the County of Galway, extended the offer to Mayor Walsh to visit Galway and accept the Freedom of the County following a resolution of the Council and in her address noted how in her role in the Chamber representing the people of Galway she ‘endeavours to undertake in an equitable, reasoned, progressive way to support policies and actions which will sustain the values of resilience; connected communities; equality and in support our unique culture and heritage. She underlined that as a son of an emigrant, Mayor Walsh has shown these values and these are the values and perspectives which have been recognised in his life and achievements to date and which have led Galway County Council to grant this civic honour of the First Freeman of the County of Galway. “We know that Mayor Walsh and his family are part of the story of Irish emigration to the U.S. Your late father John Walsh, in leaving Caladh Mháinse, Carna in 1956 and your Mary O’Malley leaving Ros Cide, Rosmuc in 1959, became part of Ireland’s migrant story,” she said. “They may have left out of out of necessity but, they seized the opportunities presented to them, meeting in the dance hall on Dudley Street, marrying and settling in Taft Street Dorchester, raising a family, contributing to their community, providing support to the Irish community of Boston, while maintaining close ties to home and giving you the opportunity to spend many summers of your childhood here. In accepting the Granting of the Honour, Mayor Walsh, addressed the gathering and spoke movingly about his strong family ties with the mother from Rosmuc and his late father from Carna and the continued connection he has for that part of South Connemara a place he calls home. He acknowledged his family members present and underlined that “Ireland and the Irish culture hold a special place in my heart, and are a large part of Boston’s overall identity as well,” said Mayor Walsh. He spoke about his life as a proud son of emigrants and the Irish community in Boston. He added that Boston is a welcoming multi-cultural city it is and his desire to remain open to what the world has to offer and what those who arrive there have to offer. Mayor Walsh thanked the Chief Executive for his comments and noted that economic and cultural ties to Ireland are undeniable, and it’s beneficial for Boston to continue to embrace, support and learn from other countries and cities. I’m honoured that our work in Boston is being acknowledged overseas,” he added. Mayor Walsh reserved a special thank you to the Members and Cathaoirleach of the County of Galway for the Honorary Freeman of the County and expressed his deep gratitude for the special honour of becoming the first Freeman of the County. “It is something that I will always cherish,” he added.